London, United Kingdom – 2014, February – In the past, most start-up companies that wanted to manufacture physical items faced a common problem of producing prototypes whilst keeping to their shoestring budgets. These new companies needed to produce prototypes of their products in order to test them or demonstrate their ideas to potential investors and customers. Additionally, many of these companies needed to tweak these prototypes multiple times before they worked out all of the bugs. Producing a few working models cost a lot of money, and start-ups who did not have investors or customers yet usually lacked funds. Marcel Botha is the CEO of Spuni, a New York company that produces baby spoons that help ease the transition to solid foods. Botha stated "it cost the company about $5 to have one spoon 3D printed, and the cost would have been ten times that much to have one spoon manufactured the traditional way, allowing us flexibility of time and cost to produce various prototypes until we created the perfect unit for Spuni." Now that these baby spoons are on the market, the company does have them mass-produced to save money. Botha reported that his company eventually even invested in their own $20,000 3D printer in order to produce and test new designs. 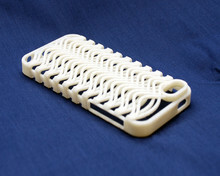 Can 3D printing be used for manufacturing? Dan Clark runs MrSpeakers in San Diego, California, and he uses ten $1,600 3D printers to produce unique and high-tech headphones for market. Each headphone consists of multiple components, takes 13 hours to complete, and retails for about $600. These printers can use a variety of materials that include metal, plastic, and even fabric. Nike and New Balance, for example, use this new technology to produce parts for specialised athletic shoes for professional athletes. But it seems as if the real strength of this method is for rapid and inexpensive prototypes that can be used to demonstrate products and test designs. Traditional manufacturing methods are still cheaper for most mass-produced items. William Hinojosa, Director of hiantechnologies.com, confirmed that the number of start-up businesses and larger corporations using their specialist 3D printing consultancy has risen already this year – "2014 has seen a sharp rise in demand for prototype manufacturing using our agency’s 3D printing facilities, with the majority of enquiries coming from businesses launching new products and therefore need prototypes to show potential investors, distributors and customers." 3D print technology is here to stay, in fact, to grow. Not only is it allowing small businesses with matching budgets produce perfect prototypes, but also ensuring they can be produced quickly and effectively. You have full permission to rewrite this article and feature it online/offline. For photography, high-res images, or questions - please contact using the details below.